← Miami, Here We Come! 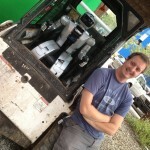 Team DRC-Hubo leaves for the DRC in Miami tomorrow morning. I want to say GOOD JOB to everyone on Team DRC-Hubo. We leave all of you with a sneak peek of our last trial runs before competition. Daniel M. Lofaro is a Ph.D. Candidate in the Electrical and Computer Engineering Department at Drexel University and works at the Drexel Autonomous Systems Lab (DASL) at under Dr. Paul Oh and is currently researching Complex Control Systems and Robotics. Daniel's dissertation topic is end-effector velocity control for bipedal robots. Nice blog and good information,thanks for sharing keep posting.